The Advanced Exoskeletal Genetic Integration System, or the AEGIS is worn by its inventor, Thomas Aaron Grigsby. Following in his mentor's footsteps, Steel Savante, Thomas protects the city and his creations using his unique and fantastic technology. Like the Steele Savante before him, he keeps his true identity hidden allowing him to develop more, in his words, "conventional technologies the world is ready to handle," a quickly shrinking gap in today's hyper-technological world. 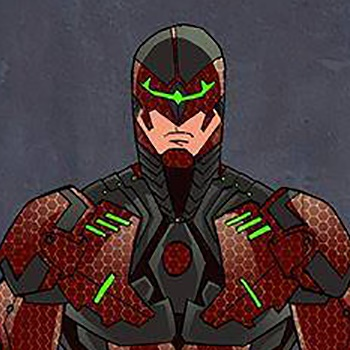 Very few know his true identity, and while Valor uses much of the technology he develops, the most powerful and dangerous technologies are reserved for to people he can trust. Though he is very knowledgeable of advances in implant, bionic limb, and bio-enhancement technologies, Like the Steel Savante before him, Thomas doesn't believe in using them on himself. AEGIS functions by utilizing an on-board, non-invasive neural network to follow Thomas' movements, meaning both work in tandem without melding the two into one. Technically, the AEGIS suit is the sixth generation of his various power suits, differing greatly from the previous generations in terms of strength and functionality. This allows Thomas to lift more than two tons over his head, run at a top speed of 68 mph, and jump incredible heights, however he rarely pushes the suit to those limits. This generation is designed for greater maneuverability, relying on lightweight armor plating with nano-weave meshes for protection, which is slightly weaker than the Gen II armor worn by Paramount, but much nimbler. Inspired by his designs for Borealis' bioenergy capacity, the AEGIS suit uses the power of electric fields in and around the user, meaning the user and those around him power the suit. The AEGIS suit is capable of inflicting lethal damage with its strength alone, but Thomas, favoring the due process of law, mostly uses non-lethal suppression technology employed by riot police. His right arm carries a collapsible stun baton while his left carries micro-turrets that are loaded with various non-lethal rounds such as expandable sticky gel that can immobilize targets and flash rounds that collide in the air to produce a bright, blinding light. Living as an orphan, Thomas grew up spending much of his development trying to garnish the attention of potential foster parents. This mentality of maintaining positivity has left Thomas usually upbeat and cheerful in almost any situation to this day. That doesn't mean he ignores it or makes light of terrible tragedies, but rather he deals with many of his problems by not dwelling on them. He is very thorough and analytical, a quality he learned from both the Grigsbys and his mentor, Zoe Lestrange the Steel Savante, though he's been known to make intuitive leaps that can seem impulsive. He believes strongly in fixing what you can, and doing your part. While he'll never understand why evil exists, he understands why he does. Thomas was orphaned at a very young age and grew up in the foster care system, spending much of his time making ends meet on the streets when not with a family and constantly exposed to violence. To escape, he tried his best to seem appealing to potential adoption candidates, but as he grew older, his chances of adoption grew more and more distant. However, when he was about to give up, he was adopted by the older Grigsby family who saw great potential in him after their interview. His new adoptive family treated him kindly, giving him the loving home experience he lacked in his childhood bouncing around mediocre and downright terrible foster families. They encouraged him to explore every single strange idea his head could come up with as it was people like him that saved the world from the ARMS pandemic in 2059. They gave Thomas their blessing saying they would be proud as long as he always kept the golden rule at heart: "Be kind, and always do the right thing." It became hard to do so when he turned sixteen and a gang of technophiles got their hands of advanced experimental energy weapons. His block became a battleground between the gang and the SCPD with his stepmother being injured in the crossfire. Unwilling to lose his precious stepparents, he did his best to jury-rigging SCPD armor and several broken energy weapons into a makeshift blaster am. Whoever had started it, he was going to end it. Which would've been the end if the exosuit wasn't firing with a low stun setting. The exosuit opened, revealing a formidable, elderly woman demanding her stolen tech back. It was when he was trying desperately to explain things that she realized he had built an energy weapon from scratch. She stepped out of her suit, whom Thomas immediately recognized as Zoe Estrange, a renowned engineer and machinist retired from Cyber Assemblies. She in turn was amazed the teenager had fashioned a functioning energy weapon from salvaged parts. After a brief talk about their plans, she decided it'd be in both of their interests to work together. After making a few adjustments to fit his larger frame, Zoe Loaned Thomas a prototype of a form-fitting exosuit, and the two set off to recover her technology from the technophiles. Together, Zoe and Thomas made quick work of the gang, with Zoe doing the lion's share of the fighting herself. They arrested the thieves and secreting the technology away when the SCPD finally showed up. When they finally got to Zoe's home, the two took the technology back to a ransacked, secret workshop. It was then Thomas finally realized Mrs. Estrange was none other than the brilliant Steel Savante, one of the original members of Valor back when they had just started out as The Earth Savers. Despite retiring from Cyber Assemblies and hanging up her nano-weave tights years ago, she still worked tirelessly, tinkering with new technologies. However, she was old and alone, and though she was healthy, she was still in the twilight years of her life. Seeing Thomas was a kindhearted, kindred spirit full of potential, she made him an offer she had never considered doing for even the closest of colleagues. "Why don't you become my protege?" Thusly, Zoe took Thomas under her wing, showing him everything she knew about technology and the world. He proved to be an adept learner, especially when it came to theoretical cyberwear and external adaptive technologies. When he was 22-years-old, Steel Savante recommended him to Paramount as her successor being "the grandson she never had." Sadly, she passed on a year later, leaving Thomas behind with her wealth of knowledge and the promise that he would continue following his stepparents' words, "Be kind and always do the right thing." Today, Thomas works for the San Cielo Police Department and Valor developing new non-lethal weapons and next generation armor, which in actuality is slowly introducing both Zoe's and his technologies as the world learns to handle them. He inherited Zoe's estate and technology, which he has used to continue Zoe's work and also making his various AEGIS suits. When he is not working, spending time with his stepparents, or trying to charm the beautiful Ava Billings, he protects the city with Valor as the Astounding AEGIS. Quotes "Look out, world! The Astounding AEGIS is nah, that won't work either. Maybe I should just skip the catch phrase What am I saying? If I can develop the world's most powerful and smallest exosuit, I can string a few sentences together!" "Please, just stand down. Anymore and you're really going to die!" "Just remember what your uncle AEGIS always says, Borealis: be kind and always do the right thing."